London, 10 July 2018: The Prime Ministers of Bosnia and Herzegovina, Kosovo, Montenegro, Serbia, Albania, Croatia, Germany, the United Kingdom, Austria, Bulgaria, France, Italy, Slovenia and Poland signed a Joint Declaration in London this afternoon which, among other things, reiterates their commitment to supporting efforts to account for 12,000 people who are still missing as a result of the conflicts in former Yugoslavia. “The Joint Declaration is a crucial document because it upholds the rights of all families of the missing to truth, justice and reparations,” the Director-General of the International Commission on Missing Persons (ICMP), Kathryne Bomberger, said after the signing ceremony at the Foreign and Commonwealth Office (FCO). 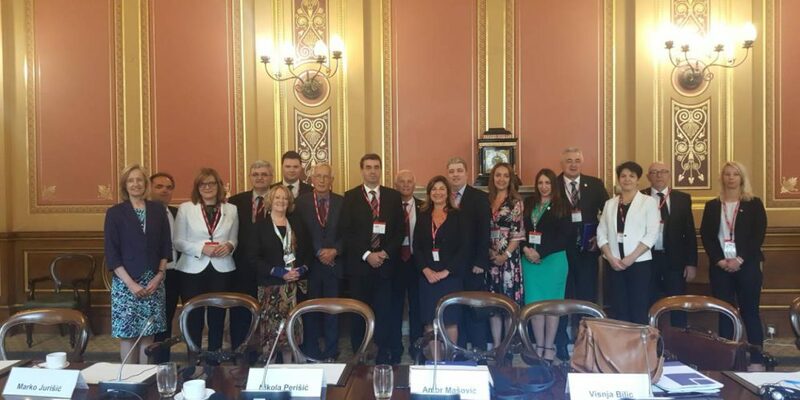 Before the signing of the Joint Declaration today by the heads of government, Ms Bomberger and the UK’s Minister for Europe and the Americas, Sir Alan Duncan, met at the FCO with the heads of the national institutions from Montenegro, Serbia, Bosnia and Herzegovina, Kosovo, Albania and Croatia that are responsible for accounting for the missing. ICMP spearheaded the successful regional effort that made it possible to account for 28,000 of the 40,000 people who were missing at the end of the conflict, an achievement that has not been equaled anywhere in the world. Ms Bomberger noted that the Joint Declaration signed by the prime ministers cites ICMP’s Declaration on the Role of the State in Addressing the Issue of Persons Missing as a Consequence of Armed Conflict and Human Rights Abuses, signed in 2014 by the Presidents of Bosnia and Herzegovina, Croatia, Montenegro and Serbia, which recognizes the centrality of “resolving the fate of the missing in a manner that is commensurate with human rights and the rule of law”. ICMP has worked intensively with all of the national institutions to develop a plan to expedite the process of accounting for the 12,000 persons who are still missing. The EU and the UK have pledged funds to facilitate implementation of the plan, which ICMP hopes will be agreed by the respective national institutions in the very near future. Under the plan, the countries in the region will address NN cases (unidentified human remains held in mortuaries). In addition, they will update records and remove duplicate records from the regional Database of active missing persons cases from the conflicts of the 1990s, and ensure the functioning of the Operational Working Group that has been set up to review cases in the Database. National institutions will also set out to access information that may be pertinent to locating and excavating clandestine gravesites within their national archives and from other sources, and will report regularly on progress. National institutions will provide regular updates on their joint efforts at regional meetings with representatives of associations of families of missing persons. The Regional Coordination of Associations of Families of the Missing from the former Yugoslavia, a civil society organization that gathers representatives from diverse associations of families, will monitor the implementation of the plan. Participating countries will present an annual report on implementation of the plan in the context of the Western Balkans Berlin Process. The Berlin Process, launched in 2014 by Germany’s Chancellor Angela Merkel, is a multilateral mechanism designed to help the Western Balkan Six to prepare for future EU membership by focusing on core challenges. The issue of missing persons was the focus of discussion at today’s sessions of the fifth Berlin Process Summit in London. ICMP will facilitate the work of the group of countries. Their efforts build upon earlier ICMP initiatives that assisted states in locating an unprecedented number of missing persons, where ICMP also provided support through its DNA standing capacities, which can work on the most challenging cases, operates on a high-throughput scale, and has generated DNA results on more than 50,000 cases of degraded skeletal remains and contributed to the identification of around 20,000 persons worldwide. Later in the day, HRH the Prince of Wales received representatives of family association of the missing as well as representatives of national institutions from the region at a reception at St. James’s Palace. HRH met families of the missing from the Western Balkans when he visited Kosovo in March 2016, and he invited representatives of the Regional Coordination to a meeting at Clarence House in London in March 2017. Both of these events were coordinated by ICMP in cooperation with the FCO.